What are Beacons [iBeacons & Eddystone] and how do they work? iBeacons are small, unobtrusive battery operated BLE (Bluetooth Low Energy) sensor devices developed by Apple™ that identify and communicate with nearby mobile smartphones and tablets compatible with Android and iOS. Eddystone is Google’s open source, cross-platform (Android and iOS compatible) Bluetooth LE Beacon technology that works the same as iBeacons but has added data payload functionality. BLE is a wireless personal area network technology and part of the Bluetooth 4.0 specification. The main driver in Bluetooth Low Energy (BLE) is the low energy consumption that allows some beacons to transmit a signal for over two years on one battery. How do Beacons interact with mobile devices? 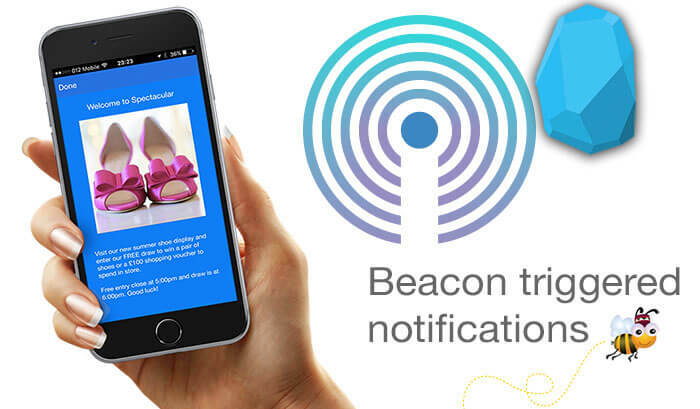 Beacons work like a lighthouse –constantly transmitting a signal in search of mobile devices to communicate with and once discovered an action is triggered such as a push alert to the users screen. Whenever a person enters or exits a Beacon’s region, the Beacon is aware and can monitor, track and send messages, offers, web links and pictures. Enabling you to reach your customers with the right message at the right time. Beacons can be positioned both indoor or *outdoors. They broadcast a continuous Bluetooth™ signal at regular intervals in order to locate nearby mobile devices and communicate with them. They provide indoor and outdoor analytics, tracking and delivery of messages, offers and promotions . Beacons constantly monitor a given region within an accuracy of one meter to a hundred meters (optimal range is 50 meters or 165 feet) - Beacon range is typically adjustable. They determine the location of a person to deliver notifications, messages, news, important information, events and offers based on their proximity to your business, products, entry or exit points. Enabling you to be relevant and present for your customers at right at the moment of the buying decision. Beacons can provide useful insights into your customers’ patterns and behaviours enabling you to provide relevant information to deliver pertinent target customers more effectively and successfully. Use for automatic check-ins at shops, events, restaurants, etc. Provide electronic coupons for discounts on food, drink & products at specific location and time. Greet your customers at arrival with a welcome message, time sensitive discount, offer or voucher. Inform customers of special promotions or reinforce your message or brand by re-targeting with a thank you message, or loyalty offer on departure. Combine Beacons and QR codes for paperless loyalty tracking program and access a history of purchases made from electronic vouchers through QR codes. Track frequent or loyal customers to help make long-lasting connections engaging customers through proximity, context, timing and audience insights. Beacons are helping retailers make long-lasting connections with customers through context, timing and audience insights to deliver effective campaigns that help grow your businesses and drive customer retention. Retailers can enhance the user-experience by offering a range of engagement and information that benefits the shopper with relevant information at the time of decision or purchase. If you're looking for a city or town app for your merchants or are a business interested in creating a local loyalty app for your community or just want to find out more our proximity marketing app or how mobile marketing can benefit your business or city contact YogoBogo today.